It was this type of contemporary appreciation of the work of the firm Morrow & De Putron that led to their popularity and success. However, an added attraction could have been the fact that one of their major clients was (the) Hordern retail family. De Putron was born in Darlington, Sydney in 1872. He was articled to R. Clarence Backhouse in 1891 before working at J. Wildridge & Sinclair, Engineers and then Robertson & Marks, Architects. In 1909, he entered into a partnership with David Thomas Morrow. In 1908 De Putron had filled a ‘vacancy on Darlington Council’, becoming Mayor in 1912. 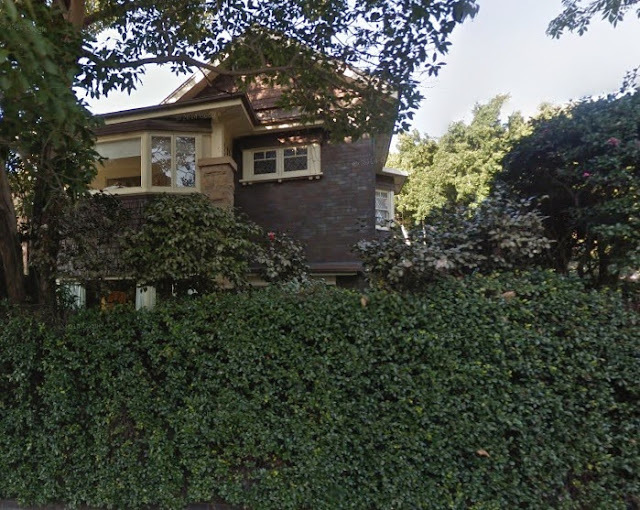 In 1911 De Putron married Alice Humphries, moved to Mosman where lived until his death in 1946. 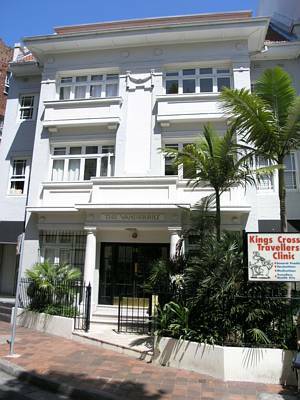 He opened his own practice in 1927 and served as an Alderman on Mosman Council from 1919-1928. Morrow was born in 1871 and articled in 1891 to Morrell & Kemp, Architects. In 1896 he married Caroline Horn and served as Mayor of Redfern Council. In 1897 he opened his own firm, D. T. Morrow and from 1909 to 1927 was in partnership with De Putron, Percy James Gordon accepted as a third partner in 1921. 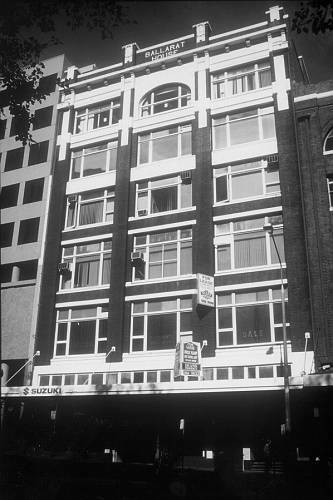 After De Putron left, Morrow and Gordon continued to practice and were responsible for two famous Sydney landmarks, the Grace Building in 1930 and in 1939 the AWA Building in York Street. By 1910, a year after they entered into partnership, De Putron and Morrow were able to put their names to a number of new buildings. The firm was originally founded by David Thomas Morrow (1871-1935) and William de Putron (1872-1925). 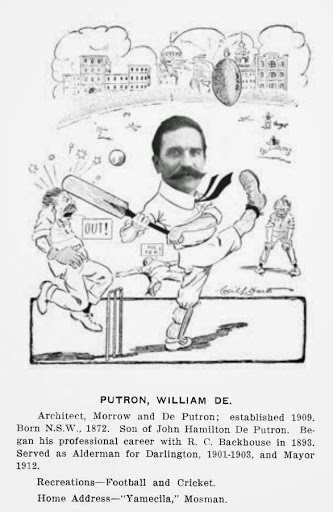 Morrow and de Putron had formed a short-lived practice in 1890-92, de Putron going on to become chief draughtsman for Robertson and Marks. 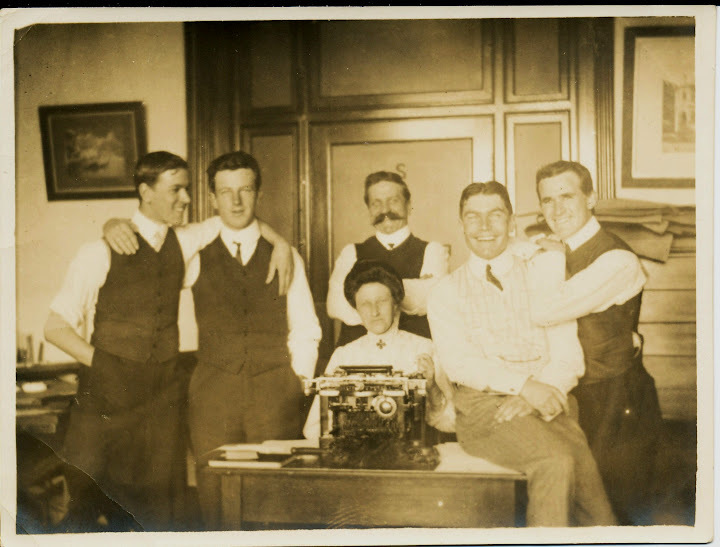 Morrow started his own practice in Newtown in 1897 and de Putron joined him in 1909, the partnership becoming D.T. Morrow and de Putron. They soon had a thriving architectural practice, notable for the substantial number of large commercial clients. These included Soul Pattinson, Grace Brothers, Anthony Hordern and John McGrath Motors. In 1921 Percy James Gordon (1892-1992) was accepted as a junior partner and the firm became Morrow, de Putron and Gordon. With the departure of de Putron in 1925 the firm became Morrow and Gordon. After Morrow resigned in 1932 Gordon became the senior partner, but the firm continued under the same name until 1992. P.J. Gordon was president of the NSW chapter of the RAIA from 1944 to 1946.
Notable commercial buildings designed by the firm include the Grace Building, AWA Building, Grace Brothers Broadway store and the Federal Mutual Chambers. Domestic commissions include Babworth House at Darling Point for Samuel Horden and Hopewood House, also at Darling Point for Lebbeus Horden. Probably the grandest Art Nouveau house in Sydney, built for Anthony Horden. It is sited on the highest point of Darling Point and is a reminder of the living style of Sydney society in the time it was built, 1905. Built 1905 to the designs of Morrow and de Peutron in the Art Nouveau style. The exterior of the house is executed in cast cement, with very fine relief patterns. An elaborate porte cochere and verandahs front the house, which is topped off with a slate roof, whose large gables have a bungalow connotation. The interiors have a wealth of Art Nouveau and eighteenth century ornament, including a significant staircase. A six storeyed commercial retail building designed by the Sydney architectural firm of Morrow and de Putron, architects for Snows until the mid 1930s and responsible for many buildings in the southern part of the City. No 350 Pitt Street, designed as a restrained example of the Federation Free Classical style of architecture, is constructed of masonry and is characterised by a full height chambered corner (corner Pitt and Liverpool Streets) and the division of its facades into full window bays. Erected in 1915 as a department store for Sydney Snow Stores Ltd, this building, replaces the original 1912 three storey building on the site which was destroyed by fire in January 1914. The building formed an integral part of the retail precinct of the Southern sector of the city, with Mark Foys and the Anthony Horden’s Palace Emporium, during the 1920s and 1930s. In 1934, openings to the southern wall of the Building were made in the second to fifth floors to link Snows to its new building at 360 Pitt Street. A pair of department store buildings which are of architectural and townscape significance. They are good examples of the Free Classical style influenced by Beaux Arts principles of design, which is rare in Australia. The twin clocktowers, which originally both had illuminated glass and steel globes, formed a familiar landmark in the streetscape of Sydney’s Broadway. .the eastern building, built in six sections between 1909-29 to the designs of Morrow and De Putron, is five storeys high. The external brick walls are load bearing and the internal structure consists of timber storey posts and composite floor structures. As elements of the townscape, both facades have Classical and Romanesque derived elements combined in a Mannerist mode; pilasters, round arched windows, cornice, string course mouldings, semi-circular pediments and obelisk finials. The facades, while similar are not identical in detail, the eastern building having multiple plate glass window bays. constructed in 1910, a significant large garden of an Edwardian style, primarily established in the 1930s, and outbuildings. English Flower Garden characteristics demonstrated by the herbaceous border, the compartmentalised areas, sunken garden, walled areas, stone steps and topiary. Milton Park gardens and homestead demonstrate exceptional design in the unusual large homestead with its well integrated Porte Cochere, verandahs and period detailing; the garden layout with distinct areas and garden themes linked by curving paths; the contrived vistas from the garden and house; and the complementing stylistic interpretation of house and garden also display creative achievement..
A large Victorian mansion built of sandstone and plastered, with a slate roof and an exterior colour scheme of Portuguese pink with white trimmings, it is of Italianate design which followed the general style of Retford Hall at Darling Point (built by E.Blacket for Samuel Horden). Retford Park is currently the home of James Fairfax AC, a former Chairman and Director of the publicly listed media group John Fairfax Limited. The European ownership of the land dates from 1821 when Governor Macquarie granted Edward Riley, two parcels of land, which included Retford Park (which he originally named “Bloomfield”). The property remained in the Riley family until the 1880’s when it was acquired by Samuel Hordern, second son of Anthony Hordern, who renamed it “Retford Park” in recognition of family links to Retford in Nottinghamshire, England. The Retford Park house was completed in 1887 and included horse and cattle facilities. Samuel Hordern and his son, Sir Samuel Hordern, were skilled cattle and horse breeders and won numerous prizes at the Royal Agricultural Society’s Easter Show. The last Hordern resident, Samuel Hordern III, died in a car accident in 1960 and an American owned company, King Ranch, briefly owned the property thereafter. It is a two-storeyed rectangular house surmounted by a square tower of 4 storeys, with verandahs on both levels around the front and halfway along each side and an elaborate porte-cochere which is almost Latin cross in shape. 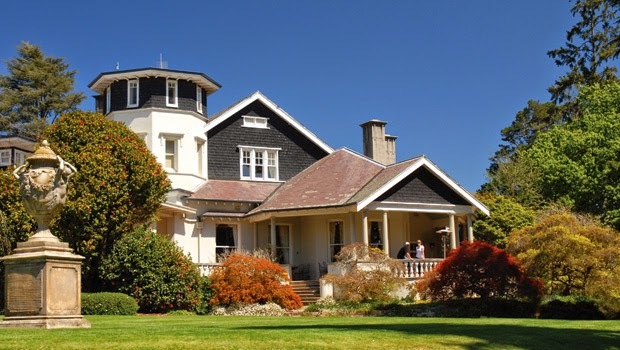 JAMES FAIRFAX, the philanthropic former chairman of the publishing company that bears his family name, will bequeath Retford Park, his imposing Highlands mansion, for the benefit of the public. Set on 120 hectares at Bowral, Retford Park has been the country home of the arts patron, 76, since he paid £15,000 in 1964 for it on a then four-hectare holding. Estate agents say its value is now about $35 million, but it could be substantially higher with any housing subdivision. Retford Park, with an Italianate revival-style mansion, dates back to the 1880s when it was the summer retreat of the retailing Hordern family. It sits in lush gardens that include the recent planting of three Wollemi pines. “I think Retford Park is an important part of the heritage of the Wingecarribee Shire area and provision has been made in my will for the house and the immediate surrounding land, including the garden, to be left in trust to be viewed by future generations,” Mr Fairfax said. $35 million gift to public By Jonathan Chancellor Sydney Morning Herald Aug. 12, 2009, 3:19 a.m. Listed on the register of the national estate since 1980, Retford Park takes its name from the village in Nottinghamshire, the northern England town from where Anthony and Ann Hordern immigrated in 1825. The grounds have many heritage oaks, an enduring association with the Hordern’s retailing business, whose emblem was an oak tree under which were the words “While I live, I’ll grow”. In his 1991 book, Regards to Broadway, Mr Fairfax recollected he’d had no plans to buy a country house. Mr Fairfax, the eldest son of the late Sir Warwick Fairfax and his first wife, Betty Wilson, has regularly bought adjoining land, making Retford Park one of the district’s prized properties. 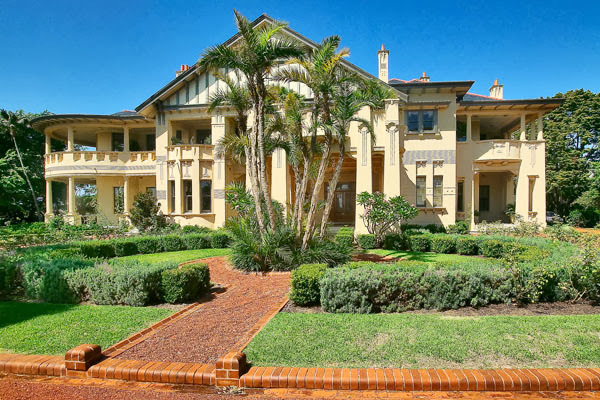 Mr Fairfax also has homes in Woollahra, Bilgola and Dorset, England. A fine example of a four storey facebrick Federation Free Classical style Commercial Building, which makes an important contribution to the streetscape of Bay Street. It is designed by the prominent architectural practice of Morrow and Deputron and provides evidence of the development of the Grace Bros Retail Empire in the early 20th century. A four storey facebrick Federation Free Classical department store building that features a parapet with rendered trim and decorative brickwork. The second and third storey timber framed windows have rendered sills and are pronounced by three vertical bays with piers that project above the parapet with rendered capping and a semi-circular design. The 1st floor is characterised by a series of modulated timber framed bay windows, which reflect the shop fronts at the street level. The ground floor openings have retained the large bay windows and original plate glass displays, original awning components, pressed metal ceiling detail and original tiling pattern at the shop entrances. Ballarat House is an early example of the Inter-War Chicagoesque style designed by an eminent firm of Sydney architects, Morrow & DePutron, as spacious, flexible rental accommodation with minimum structural obstructions. It demonstrates in its history the changing demands of city occupancy such as the rise of trading in motor vehicles and parts. Its street appearance is austere and elegant, expressing its minimal construction and presaging the development of fully framed structural systems. It also has significance for its contribution to the Wentworth Avenue streetscape. The Vanderbilt has historical significance as it dates from one of the key period of layers for the development of Potts Point as a direct result of the subdivision of the Springfield Estate. It is aesthetically significant as an Inter-war Free Classical style residential flat building, designed by the prominent architectural practice of Morrow, Deputron and Gordon, which demonstrates key aspects of the style and is an integral part of the Springfield Ave streetscape. A three storey Inter-war Free Classical style residential flat building. It features a terracotta tiled pitched roof with an eyelid dormer which comprises a band of square windows. The façade is symmetrical with the two central bays projecting which originally featured balconies which have been enclosed. The outer bays feature double hung sash windows. The building at 14 Etham Avenue was designed by Morrow and De Putron, architects of the nearby mansion building Babworth House for Samuel Hordern, brother of the well known Sydney storekeeper, Anthony Hordern. 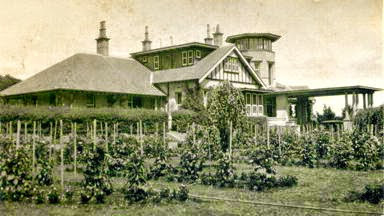 The house is two storey with the living areas all situated on the ground floor and the main entrance located from Etham Avenue with a deep covered porch entering into the main hall with a drawing room and library opening north to a prominent verandah overlooking Sutherland Crescent and a Dining room , Kitchen and laundry on the south side. The main staircase is ;located at the end of the main hall and gives access to three bedrooms, bathroom and wc, maids room and the upper level of the north facing verandah opening off bedroom one and two. The site of 14 Etham Avenue, Darling Point has some historic significance as part of the earlier estate of Etham House. The building has aesthetic significance for its contribution to the streetscape of Etham Avenue precinct and as a largely intact and fine example of a residence constructed in the period of development after the sale and subdivision of the Etham Estate. The building is significant as a design of the architectural firm of Morrow & De Putron, designers of the nearby mansion Babworth House for the Hordern family. 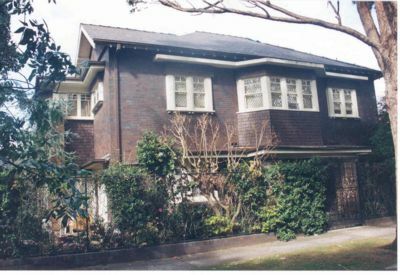 The house is a fine and largely intact example of a medium sized residence in an Australian variation of the English Queen Anne style, using face bricks and tile hanging as decoration. The building has social significance as part of the evolutionary development of the district and as an example of the more compact residence which was designed for the minimum of household assistance. Thornton Street, Darling Point, N.S.W. Originally a house built for Lebbeus Hordern by Morrow & Deputron, Hopewood House was a finishing school in the 1930’s and later a hospital. In February 1915 they made their first building application to Mosman Council. This was for additions to ‘Tudor’ in Mandolong Road, the home of Mrs Louisa Bull, the wife of Nathaniel George Bull II, a cousin of Samuel Hordern II. In May 1916, they submitted a building application for a house for Mr Jay of Wharf Road (now Burrawong Avenue) following in July 1916 with an application for a house in Mandolong Road also for Mrs Louisa Bull. 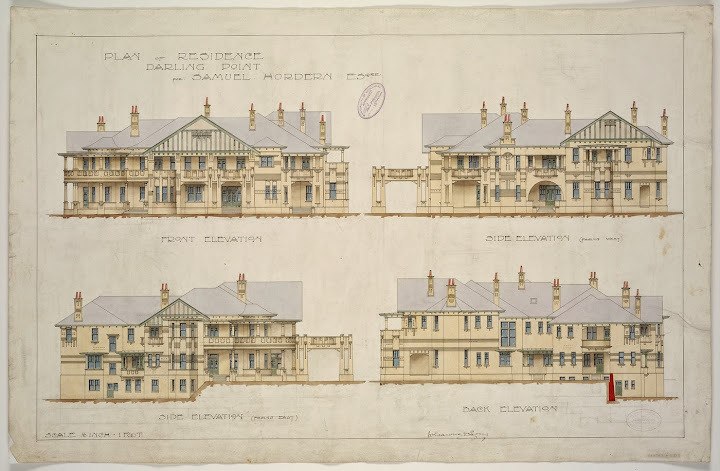 Morrow and De Putron designed over 40 buildings in Mosman during the next eleven years. These included new buildings and alterations to existing residential and commercial buildings. 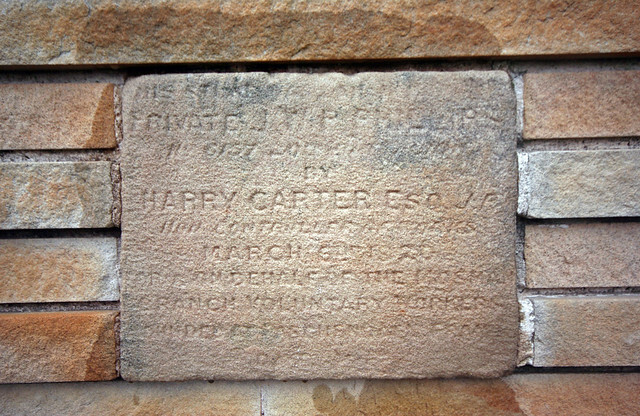 A weathered sandstone plaque in the modern boundary wall facing the road at 71 Bay Street is one of the few reminders that the block – labelled Lot 43 in Mosman Council’s 1917 Building Register – was home to six weatherboard cottages built by the Mosman branch of the Voluntary Workers Association for disabled servicemen and war widows. Mosman Library’s Local Studies Librarian Donna Braye has researched the stone plaque, and the cottages, which were designed by a local architect, William De Putron of Clifford Street. Today the cottages would be numbers 67 to 77 Bay Street. ‘Fetherston’s Hall’, The Esplanade, Balmoral, 1923.